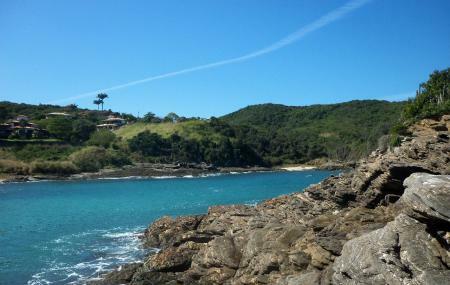 One of the most romantic beaches in Buzios, the Praia Ferradurinha is loved for its rocky outcrops and a small scenic beach with clear waters. Most of the people who visit the beach swim to the “lover’s Beach’’ which is the highlight of the region. If you are not into sun-bathing, you can explore the rocky terrains around the beach or simply take a dip in its pure waters. The beach is flooded with small shacks which serve good food. Wear sunscreen and wear sturdy shoes if you want to explore the rocky shore. Carry a change of clothes if required. Prices for parking may vary. How popular is Ferradurinha Beach? People normally club together Geriba Beach and Tartaruga Beach And Park while planning their visit to Ferradurinha Beach. Beautiful beach with calm waters. Pints off for annoying vendors and difficult parking. Not much shade unless you rent an umbrella. Very beautiful rocks for climbing nearby. Lovely little beach with amazing rock formations and crystal clear water. Perfect for stand-up paddle and kayak (tbey have kiosks where you can rent equipment)... chairs, parasols, food and drinks also available. Highly recommend!